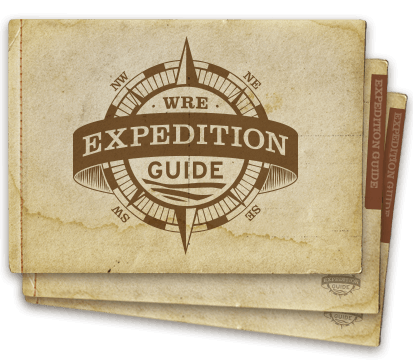 Western River Expeditions offers 6-7 day rafting trips through Grand Canyon which can include half a day spent exploring the first two miles of Havasu Creek where it meets the Colorado River. 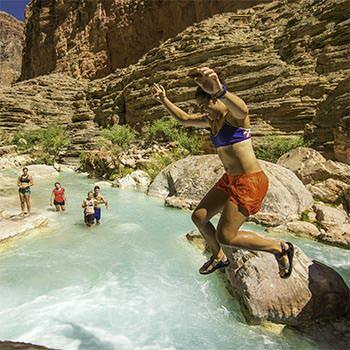 If you want to visit Havasu Creek with Western River Expeditions, you'll need to be willing to spend 5-6 days rafting 150+ miles of the actual Grand Canyon, seeing all kinds of other amazing waterfalls and sights the Grand Canyon has to offer. If that interests you, then keep reading - or give us a call! HAVASU CREEK IS NOT EASILY ACCESSIBLE - Grand Canyon and Havasu Creek are not for individuals looking for a day trip with inner-tube floats and easy strolls. Please keep reading before calling. We DO NOT offer guided backpacking tours.If you want to hike to Havasu Falls from the rim of the Grand Canyon, be prepared for an 8 mile backpack trek from the rim of Grand Canyon through the Havasupai Indian Reservation. You will need to contact them for a hiking permit. Learn more on sites like NPS.gov and others. A few popular viral videos seem to depict the Grand Canyon as easily swimmable through turquoise waters. In reality, only about 100 yards of Havasu Creek are depicted in one 30 second video, making it appear that ALL 10 miles of Havasu Creek are easily swimmable, or accessible by kayak or raft. 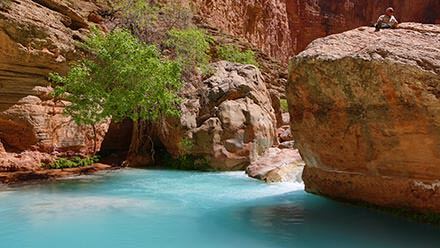 We love to explore the lower section of Havasu Canyon, but exploring all 10 miles of Havasu Creek is a significant endeavor with elevation gain and rough hiking trails between each pool along the creek. 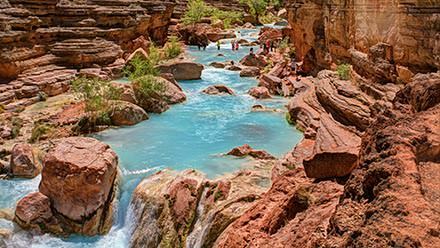 The inviting blue-green waters of Havasu Creek, and the popular Havasu Falls, in the Grand Canyon create an eye-popping desert oasis between towering red canyon walls in this tributary of the Grand Canyon and the Colorado River. The Havasupai ("people of the blue-green waters") guard these waterfall gems in their remote canyon village, roughly 8 miles down from the trailhead on the rim. Getting to the trailhead itself is a feat given the vast distances between populated cities in the southwest. But the reward of Havasu Falls, Mooney Falls and Navajo Falls beckon many adventurers to pay the permit fees to the local natives, or to tour guides willing to get you there. Please note that in order to see Havasu Falls and the other upper waterfalls of Havasu, you must make a reservation directly with the Havasupai Tribe. While many visit Havasu Falls lugging backpacks by dusty desert trail, we prefer the float-by-river approach! This means booking a rafting trip from Lee's Ferry, Arizona and rafting several days on the Colorado River, towards the mouth of Havasu Canyon. The ten miles of Havasu Creek, from the Colorado River up, are some of the most jaw-droppingly gorgeous places on the planet - one reason we sit and play a while without making it all the way to the higher falls near the village. 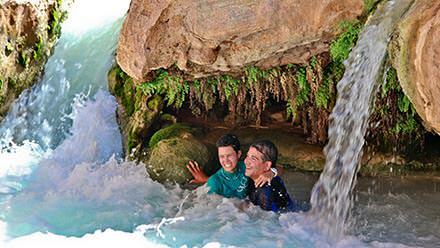 While the lower pools and falls of Havasu Creek are less well known, they are every bit the paradise in the desert. There is a whole Grand Canyon to explore. There are spectacular waterfalls like Elves Chasm, Vasey's Paradise or spectacular Deer Creek Falls - all easily accessible by river. (see photos below). 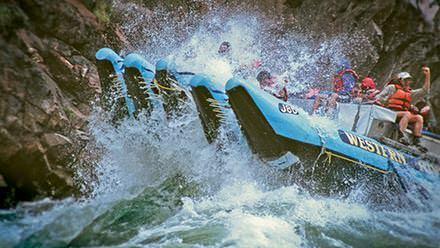 Enjoy world class whitewater rafting, the bragging rights that come with it, expert guides, and delectable food for every riverside meal, all in the awe-inspiring grandeur of the one-and-only Grand Canyon. Top off your vacation with a day at Havasu Creek, then on to the notorious Lava Falls, and a thrilling Helicopter ride out of the canyon the next day. What's Havasu Creek all about? Rating guides and guests explain why Havasu Creek is one of their favorite stops on a 6 or 7 day expedition on the Colorado River through Grand Canyon. Vasey's Paradise spills out from the canyon wall about 30 miles downstream from the start of the 6 or 7 day expedition. A wide variety of botanical species flourish in the clear warm water of Vasey's Paradise. The Little Colorado River's turquoise waters are often mistaken as those of Havasu Creek. The confluence of the Little Colorado is an amazing place of its own, and is sacred to several tribes. Elves Chasm is a small place, but so memorable that it becomes the token icon shared between Grand Canyon river trekkers - a bond lost on those who've never been through Grand Canyon. Deer Creek Falls thunders150 feet down, landing within sight of the Colorado River. "The Patio" above Deer Creek brings you to one of the most sacred places anywhere in the Canyon. The Grand Canyon, from Mile 0 at Lee's Ferry to Mile 188 at Whitmore Wash is arguably one of the planet's most scenic and surprising places on earth. Continue reading the itinerary outlined below to gain an understanding of all the wonders hidden within the 188 miles of the Colorado River through Grand Canyon both upstream and downstream of the confluence with Havasu Canyon. Meet your crew and rafts at 7:30 AM at Marble Canyon, Arizona, a dramatic launch point on the Colorado River (options for travel and accommodations described on next page). After a short ride to the river’s edge you’ll load your duffle into a dry bag, listen to a brief orientation from your guides and set off begin rafting the Grand Canyon. Drift lazily, relax, and then savor lunch on a white sand beach. Mighty House Rock Rapid and the Roaring 20’s set the pace for the next five days. Visit Vasey’s Paradise, a spectacular cascade of water that supports a lush hanging garden, and Redwall Cavern, a vast chamber carved by the river. Hike breathtaking side canyons or visit ancient Anasazi granaries. After a leisurely swim in the warm, turquoise waters of the Little Colorado River, you’re on your way to Hance, Horn, Granite, Hermit and Crystal…all rapids respected for their huge waves. Western’s knowledgeable guides lead short hikes to hidden Elves Chasm and to pounding Deer Creek Falls. Spend some time exploring the azure green waters of renowned Havasu Canyon where countless tranquil pools beckon you to find your own private piece of this water paradise or explore other possible side canyons and waterfalls throughout this section of the canyon. After dining on Western’s famous evening cuisine, capture the dazzling glow of the sun on the canyon’s towering walls before it slips into the horizon. Vulcan’s Anvil, a volcanic cone mid-river, signals the approach of Lava Falls, the Colorado River’s most notorious rapid, making rafting the Grand Canyon truly memorable. By mid morning, you’ll meet your helicopter that will take you over the canyon rim to Bar Ten Ranch for a shower and lunch, before your return flight to Marble Canyon or Las Vegas.